Eco Resort Chiang Mai creatively reinvents the simplicity and accessibility of the hostel concept beloved of budget travellers, backpackers and nature lovers looking to explore Thailand and share experiences. The hostel, really a boutique resort, offers: 67 clean, comfortable and fully air-conditioned rooms in five configurations, arrayed with a total of 174 beds. WIFI internet is free throughout the hostel. Days begin at a relaxed tempo in the boutique resort’s lush tropical garden. Lazy afternoons unfold at the 50-meter outdoor swimming pool. For meals and refreshments, the hostel's Barn House Restaurant offers authentic northern Thai tastes alongside international comfort food. All conveniently located on Bumrungraj Road, with Chiang Mai Bus Station and Railway Station only a 5-minute drive away. Chiang Mai's cultural treasures are equally at-hand, as is the renowned Chiang Mai Night Bazaar, lots of shops and restaurants and vibrant nightlife. ​​Eco Resort Chiang Mai welcomes single travelers, families and friends with traditional Northern Thai warmth and commitment to be friendly and helpful, including sharing the information and experiences that make touring in these parts such a pleasure and revelation. 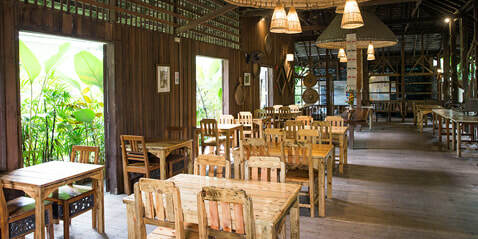 Eco Resort Chiang Mai is also perfect to host delightful private parties and wonderful weddings. School outings are also welcome to come and experience Chiang Mai based at Eco Resort where you will find full support for a relaxed and informative trip. There's so much to do here, and not only sightseeing. Why not take the opportunity to learn how to cook in authentic northern Thailand style with a class with our expert specialist chefs? Or host an unforgettable weekend BBQ party in the cool, fresh outdoors of Chiang Mai City? As a boutique resort and hostel that welcomes visitors literally from all over the world, you're bound to meet interesting people here and make new friends as you exchange your experiences of a lifetime.